A reblooming yellow iris appeared suddenly that I was eager to share. 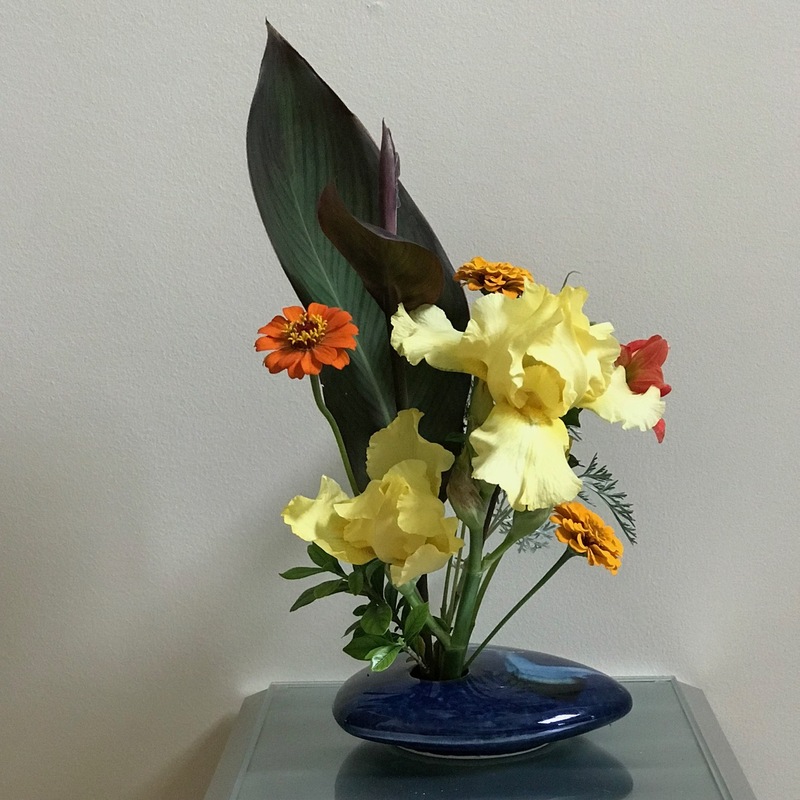 While awaiting Hurricane Florence earlier in the week, I prepared a vase for today by foraging foliage from several previous weeks’ vases and pulling in a freshly cut dahlia and a handful of zinnias. There was not time to fuss with this one. We are safe from the storm and feeling very grateful. Hope you dear readers in the affected areas fared well also. 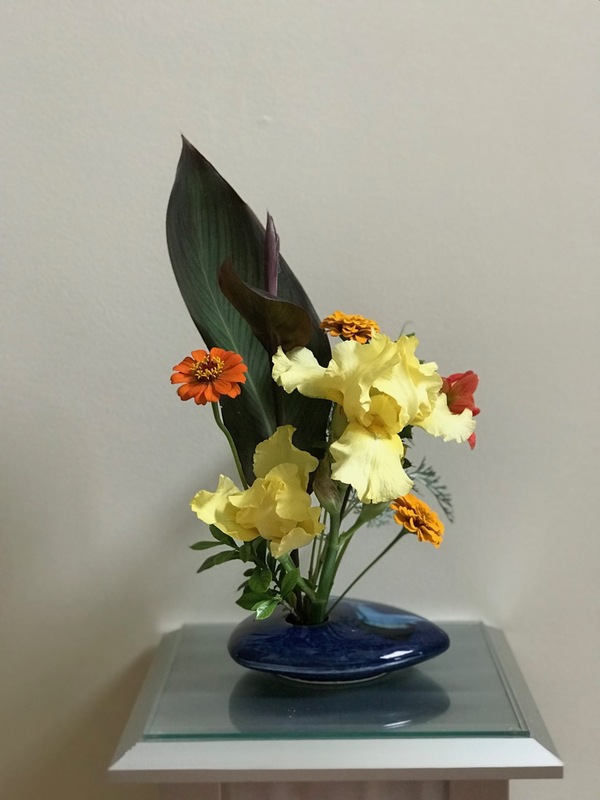 This entry was posted in garden and tagged 2018vase, canna, Dahlia ‘Fireworks’, flower arranging, flower design, gardenia jasminoides 'August Beauty', in a vase on monday, nature photography, reblooming iris, Zinnia 'Cut and Come Again' (Zinnia elegant pumila) on September 17, 2018 by pbmgarden. Again that decadent canna! And what a joy to see such a pretty iris rebloom. So glad you and your garden escaped the worst of Florence. Have a good week! Thanks Cathy. Yes the canna! Oh well. You’ve used my favourite vase! The Iris is beautiful and I love how you’ve combined it with the other flowers. The vase makes it so easy to put a quick arrangement together. It was a treat to see the iris because we had such a wet winter these yellow rebloomers didn’t bloom in spring. It is always nice to get a surprising bloom. I’m glad you are safe from the storm. Thank you.The iris is a bright spot in the week.! I don’t think I have ever seen a yellow iris…and doubt except through your blog whether I’ll ones as perfect as yours. Hope your garden doesn’t have too much damage from the storm. Thanks Noelle. The garden held up amazingly well. We’re still having lots of rain but the wind from the hurricane was less severe than expected. Seeing your Iris makes me think I should give some thought to re-bloomers. It’s gorgeous and a nice pick me up at the moment. Glad to hear you made it through OK. After our 10 inches of rain overnight in August, I have been stunned at the amounts you are getting down there. Very frightening. I too keep thinking I should add more rebloomers. The yellow feels more like a spring color. Many places are underwater and cut off. Although the winds were less than predicted the flooding part has lived up to the hype. Thanks Cathy. Huge solid leaves like that canna make a good backdrop. I’ll have to remember to look for things like this again. I always enjoy participating in your vase convention each Monday! Glorious! So glad you’re safe from the storm and hope your garden damage is minimal. Thank you Peter. The garden needed my attention even before the storm. Perhaps I’ll get some cleanup done, but yes, we were pretty lucky. That Iris is gorgeous but most of all I was just happy to find that you’d posted and that you’re safe. Is the flooding bad in your area? Hi Kris, there was a lot of flooding around us yesterday. Sections of downtown main street (Franklin Street) were underwater as was a shopping center. Many streets were closed off nearby but waters have receded on them today. Along the coast as well as the southeast NC county where I grew up are devastated for the second time–Hurricane Matthew had it underwater two years ago and it is again. UNC Chapel Hill resumed classes today. How refreshing to see Iris out of season (at least here). They are the perfect foil for the smaller flowers you have used. Hi Ricki, many reblooming irises and azaleas are sold these days, but I agree they do seem out of season. It was a gentle surprise. That is nice for a reblooming iris. I stick with the conventional cultivars that bloom only once. All my favorites are old classics. I see rebloomers about town, but the second bloom typically does not look as good as the first. What a lovely surprise – it always startles me to see German iris flowering outside of spring. Lovely arrangement, Susie, and glad you made it through the storm. Blessings! I agree Eliza, irises in fall are a bit unusual. We’re grateful here to see Florence head out. Oh, I’m glad to hear you’re safe and content. Irises in September–that is fabulous; as is your pretty arrangement! Thanks Beth, yes we’re ok here. I was happy to see that iris so I didn’t have to rely on zinnias completely again. I found solace in the yellow iris as well Judy. It was a message of renewal in the midst of the storm. 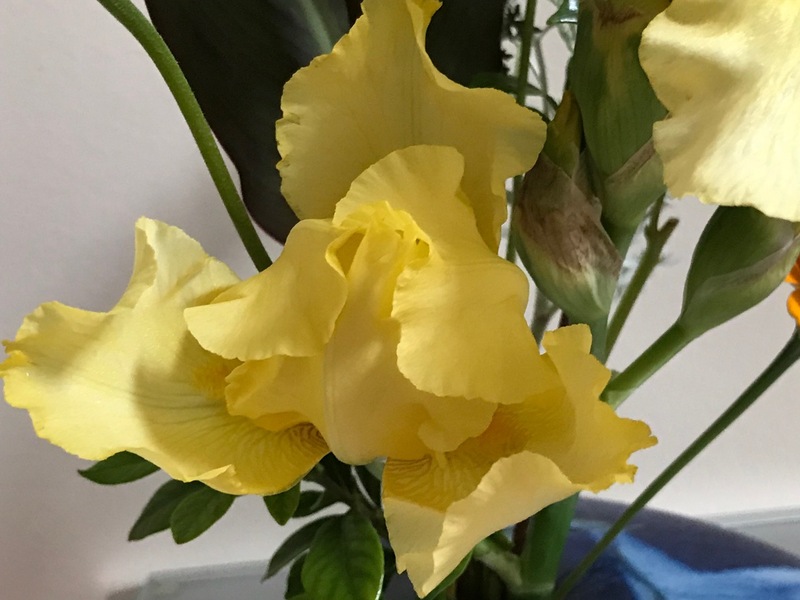 The Canna leaf was a stroke of brilliance for contrast.The yellow Iris is beautiful; afraid I am a stick in the mud about fall blooming spring flowers. Thanks. I easily understand. I’ve had the iris bloom when it’s cold and that’s even weirder. Yes, too weird. I think I may have been the first to dislike Encore Azaleas!! That’s a very large and luscious reblooming Iris! It had 4-5 large blooms on it. 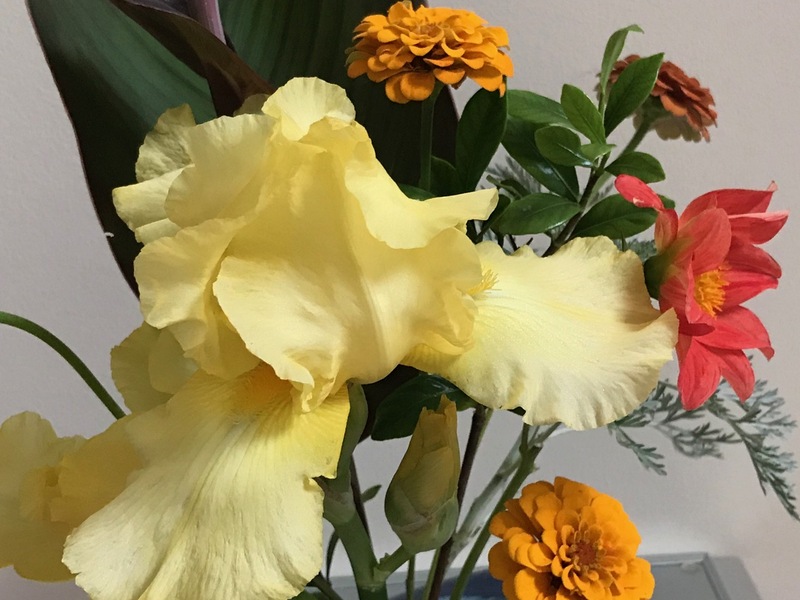 A stunning iris and beautiful arrangement!